MiOTA Service Awards recognize members and others for their support of the association and profession of occupational therapy. Award recipients are acknowledged at MiOTA's annual conference. Award nomination submissions for the following year will be accepted beginning in summer of each year. We are accepting nominations for MiOTA service awards through September 18th, 2018. If you'd like to nominate a MiOTA member for an award please complete and submit the 2018 Award Nomination Form. To express the appreciation of the MiOTA to members and non-members for extraordinary contributions to the advancement of OT. Their efforts could include but are not limited to financial contribution, political support, pioneer work, or outstanding leadership role. Nominator shall submit a narrative specific to the award purpose and criteria, and a curriculum vitae or resume. Nominator shall submit an additional paragraph of approximately 50 words summarizing the nominee’s contributions. To honor members of MiOTA who have made an outstanding global contribution to the profession via encouraging the desire to contribute to the development and growth of the profession, focused public attention on the scope of OT, increased awareness of OT as a health provider and as a profession whose body of knowledge and skills are innovative in research and in implementation of new approaches to increasing quality of life. The nominee shall be an OTR and a member of MiOTA. The nominee shall have demonstrated an outstanding global contribution to the profession of occupational therapy that enhances the quality of life. The nominee shall have served as a leader within the profession and the healthcare community fostering growth and development of the profession and the MiOTA. An additional paragraph of approximately 50 words describing the nominee’s contributions shall be submitted by the nominator. Highest Association award for an OTA to honor members of MiOTA who have made an outstanding global contribution to the advancement of occupational therapy via exemplifying the highest level of technical skills and knowledge that benefit the profession of occupational therapy. Has served as a leader within the profession and the healthcare community and fostered the growth and development of the profession or MiOTA. The nominee shall be a OTA and a member of MiOTA. The nominee shall have served as a leader within the profession and the healthcare community fostering growth and development of the professional and the MiOTA. Nominator shall submit a narrative specific to the award purpose and criteria and a curriculum vitae or resume. To recognize members of the MiOTA who, with their knowledge and expertise, during their career have made a significant contribution to the continuing education and professional development of members via utilizing special skills and/or knowledge in therapeutic practice, education, research, and/or administration. 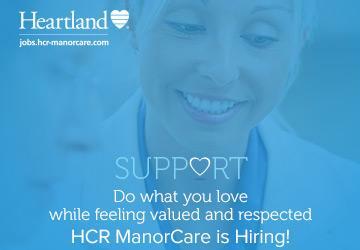 Both scholarly contribution and organizational leadership will be considered. The nominee shall be a member of the MiOTA. 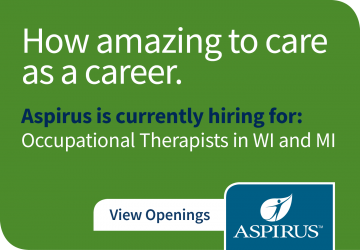 The nominee shall have made a significant contribution to the profession by utilizing special skills and/or knowledge in therapeutic practice, education, research, and/or administration.Both scholarly contribution and organizational leadership will be considered. To honor a member of MiOTA for extraordinary service to the MiOTA. The nominee has made continuing and outstanding contributions to the development, growth, and process of MiOTA. To recognize a member of MiOTA for significant contribution in promoting OT in the political arena via assuming an active role in training and organizing occupational therapists to impact on federal or state regulations and/or policies, educating legislators of other key government officials about the purpose and function of OT, responding to requests for action from the legislative committee of the MiOTA, acting as an advocate for consumers of health care and educational services, or playing an active role in state activities related to state PACs. Nominee shall be an OTR or COTA, and a member of MiOTA. 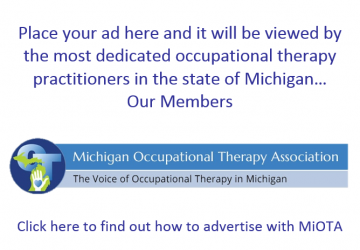 To actively support MiOTA participation by recognizing occupational therapy departments in which 80% or more of the staff are members of MiOTA. Nominator shall provide a list of all department members and MiOTA number of those who are members of MiOTA. To recognize MiOTA members who have, or are, retiring, and who have performed distinguished service in the field of occupational therapy. The nominee must be a member of the MiOTA. 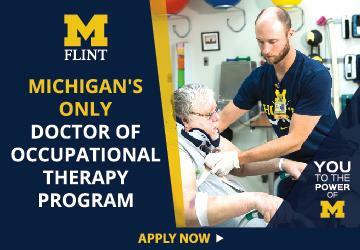 To recognize members of MiOTA, who with their knowledge and expertise, have made a significant contribution to occupational therapy through a combination of some of the following: supervision of students and staff; articles and presentations; workshops; mentoring; education; therapeutic work with clients and families. This therapist stands head and shoulders above the crowd: a model for fellow therapists. The nominee shall be a member of MiOTA. Documentation by nominator of outstanding contributions of the nominee. Submission by nominator of nominee’s vita or resume.